I invite you all to consider the experience of Saint Augustine, who said that the heart of every person is restless until it finds what it truly seeks. And he discovered that Jesus Christ alone is the answer that can satisfy his and every person’s desire for a life of happiness, filled with meaning and value (cf. Confessions, I.1.1). As he did with Augustine, so the Lord comes to meet each one of you. He knocks at the door of your freedom and asks to be welcomed as a friend. He wants to make you happy, to fill you with humanity and dignity. The Christian faith is this: encounter with Christ, the living Person who gives life a new horizon and thereby a definitive direction. And when the heart of a young person opens up to his divine plans, it is not difficult to recognize and follow his voice. You, my dear young people, are the hope of the Church! 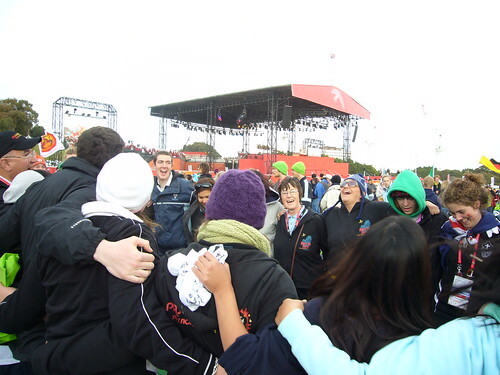 She expects you to become messengers of hope, as happened last year in Australia, during World Youth Day, that great manifestation of youthful faith that I was able to experience personally, and in which some of you took part. Many more of you will be able to come to Madrid in August 2011. I invite you here and now to participate in this great gathering of young people with Christ in the Church.